We are very fortunate at Nelson Manor to have a great relationship with the families of residents past and present. 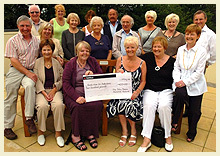 We also have a wonderful group of local supporters, who help us in often immeasurable ways. To all of you, a massive THANK YOU! Often, it is time we value most. People taking the time to visit our residents, volunteer to help with trips and activities, and provide active support for our events. 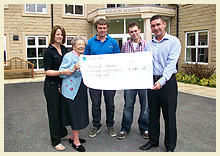 But we are also extremely grateful for donations, sponsorship and items to commemorate residents who have passed away. Any cash goes in to the Residents' Fund. This is used to ensure that less able residents can take full advantage of our varied and busy activities programme, such as providing special transport. It also buys games, craft materials and other things which make lives richer and more fun for all our residents. To make a donation, please press the button below. To offer other forms of sponsorship and support, or to discuss a commemorative gift for your loved one, please fill out this form and someone will contact you as soon as possible. Or please feel free to ring us direct or call in to Nelson Manor. Your message is received. Thank you for contact us.